As November 18 (US release date) draws nearer, many of us are itching in our home-sewn robes to feast our hearts upon a fresh new facet of the wizarding world. But where are these fantastic beasts, and who exactly is going to help us find them? Eddie Redmayne, a.k.a. 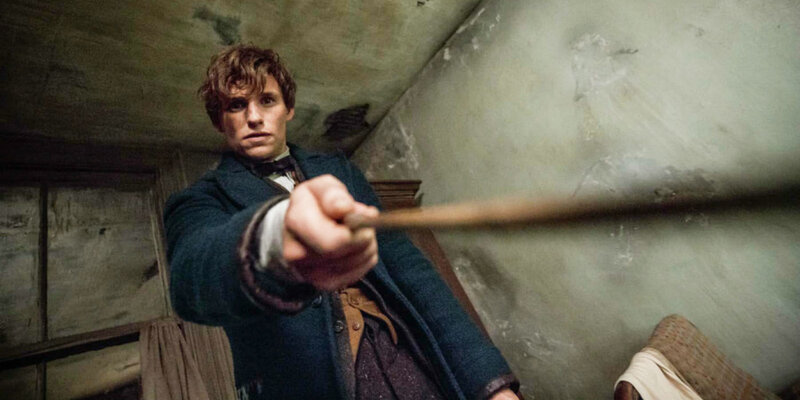 Newt Scamander, talks to CBS’ Tracy Smith about his role in the the upcoming film. TRACY SMITH: Do you get the sense that people are eager to see this movie? EDDIE REDMAYNE: You know, the moment that I got a sense that people were excited was when I went to Comic-Con. Now I’d never been to Comic Con. I’d heard a lot about Comic Con before. And we went to show a sort of new trailer of it. And I walked into this huge auditorium of thousands of people. And there were people dressed up as Newt Scamander, the character that I’m playing, which I found sort of uncanny and weird and exciting (Laughs) and kind of bizarre all sort of rolled into one. So that was an exciting moment. I feel like J.K. Rowling’s world is one that is owned by everyone in some ways. People have grown up with it and have such a sense of that universe that there’s something kind of wonderful seeing everyone get involved. For those thirsty only for his relation to the Potterverse, no need to go further than page 1. Astute witches and wizards may delight in the discussion about how the creatures were formed and filmed, a mix of puppetry, green screen magic, and sheer imagination. TRACY SMITH: [...] So in “Beasts,” these beasts are computer-generated. How do you pull that off? EDDIE REDMAYNE: Well, what I found kind of riveting was, I thought when I joined this film that there would be people [who] go, “Well, this is how it’s gonna be done.” But the amazing thing about director David Yates and David Heyman, the producer, is -- despite the scale of these films, and they worked on many of the Potter films -- there is an intimacy to the creation of it that feels really collaborative. J.K. Rowling wrote this script and yet she allowed us to come up with ideas. So when it came to the beasts I remember David Yates saying, “Well, why don’t you spend a few weeks, months working out what would be best for you?” I ended up working with all sorts of puppeteers. Some of the guys who had worked on “War Horse” came up with huge puppets. And then sometimes there were actors dressed in green-screen things for me to interact with. And then sometimes it was just imagining. There’s one little guy called Pickett who is a Bowtruckle. I kind of adore him. He’s a sweet little stick insect figure. And they made a little wire puppet for me to rehearse with. So I did a couple of weeks’ rehearsal. Then in the end I would just sort of imagine he would stand on my hand. And I’d just find myself on the tube, on the subway kind of gently talking to imaginary figures! Just look at that bowtruckle. I’ve never felt more affection towards an ambulatory bundle of twigs. Eddie Redmayne goes on to describe his ongoing journey into acting, his Oscar-winning role in The Danish Girl (about the life of Stephen Hawking), and baby poop (page 6). Fortunately for all, he seems to be as excited about the film as we are. And soon we will follow him into parts familiar yet unknown, eyes shining as if we were ten, wands ever at the ready.